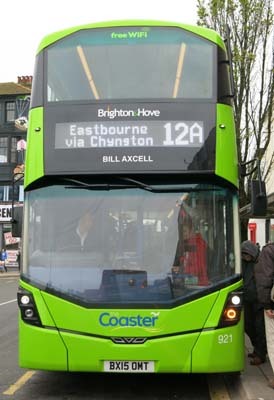 Connections with Brighton and Hove : Generations of Brightonians and visitors using Queen’s Road stopped and stared through a window. For sitting there with a flame was Bill Axcell the glass animal man, creating magical and wonderful figures He started his unusual trade at the Aquarium and then from the early 1960s worked in Queen’s Road. Axcell could make anything from a carousel to a single flower that children could afford with their pocket money. He once said that his window must contain the nose print of every child in Brighton. Although he died in 1991 aged 63, he touched the lives of many people and was well known far beyond Brighton. Towards the end of his life he was asked to provide the elephant trophies for Ian Botham's epic walk across the Alps. Born in Leigh-on-Sea in Essex, he moved to Brighton in the mid-1950s. He said that he had never done a day’s work in his life because his job was his hobby. He also sold rocks and minerals at his shop which was a real treasure trove for many passers-by. 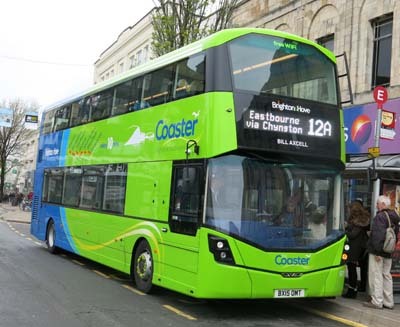 921 Mercedes Streetdeck - carried name since delivery in April 2015 on Coaster Route 12.